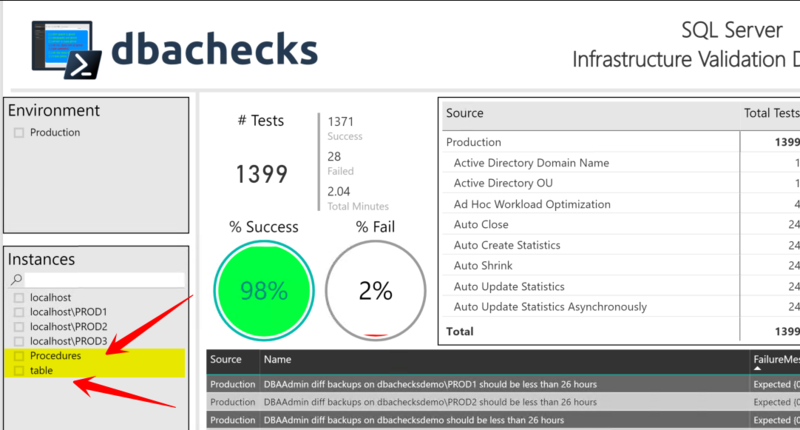 dbachecks is a new PowerShell module from the SQL Server Community! For more information, read introducing dbachecks. I will share one of the ways I like to use dbachecks when I’m knocking down the problems in order to increase the green percentage and lower the red one! Do you save one file per instance (all tests included)? There is not a single way of doing this. Neither a “correct way”. Here you can find another different way grouping your results per application. I will share the way I like to use it, when using the PowerBI dashboards to analyze the results, and explain the advantages I get from it. My personal choice is to have one file per check and environment. This means that if I’m running a check for SuspectPage I run for all instances/databases belonging to the development environment, I will end with a file named dbachecks_1_SuspectPage_DEV.json. Keeping the same line, I will get a filename dbachecks_1_SuspectPage_PRD.json if I run it for production. Invoke-DbcCheck -SqlInstance $sqlInstances -Checks $_ -PassThru -Show Fails | Update-DbcPowerBiDataSource -Environment "DEV" -Path "C:\windows\temp\dbachecks"
Currently, we have 80 checks if your approach is 1 file per environment you will end up with 3 files. The way I like to do it, I will end up with 240 files. Yes, it is a big difference but that is no problem at all! The Power BI file will deal with this increase flawlessly as I have mentioned before on dbachecks – Using Power BI dashboards to analyse results blog post. The biggest advantage, for me, is the possibility I have to re-run a single test for a single environment and with it, only touch just one of the files. It’s an update of that file. By doing it, for the same destination folder, I will overwrite the existing file then I literally just need to go and hit “Refresh” button on PowerBI dashboards. You run, overnight, all your tests. You look to your red values. Go to your Power BI and hit “Refresh” again. The point 6 is where you will save huge amounts of time because if you have just one file for all tests for one environment, you would need to rerun ALL the tests in order to refresh your environment. In this blog post, I will write about the Power BI dashboards that we have created to analyse the output of the tests. Here, at dbachecks team, we don’t have BI gurus. This means, that what you are about to see come from our non-BI minds plus some research on the web to achieve the output we wanted. The main objective is to have something functional, that helps to make decisions and help to know where we should look next. That being said if you master Power BI, M query language, DAX or other stuff that we have used or can be used on this project and you found some archaic or a too much year 2000 way to do some stuff, let us know! We would love to follow best practices and improve the dashboards. I started to work with Power BI after seeing a couple of sessions where it was and was not the main attraction. One of those sessions was from Rob Sewell (b | t) where he was showing Pester and, to show the output, he has used Power BI desktop. This means that he is the principal “culprit” for this choice 🙂. If, in addition to that, we join the ease of import the JSON (and other) files, the usefulness and the eye-candy dashboards all together made the decision easier. With this in mind, I picked the initial Power BI from Rob and started digging on it and make some changes. Note: If your tool of choice is not Power BI or you just feel more comfortable using another tool to work with JSON files, please share your dashboards with us. Write about it and share with the community. dbachecks output consists of one or more JSON files. When you write your dbachecks scripts you can choose between just one or more files as result of your validation. For instance, you can generate one output file per context or just one that includes all contexts. 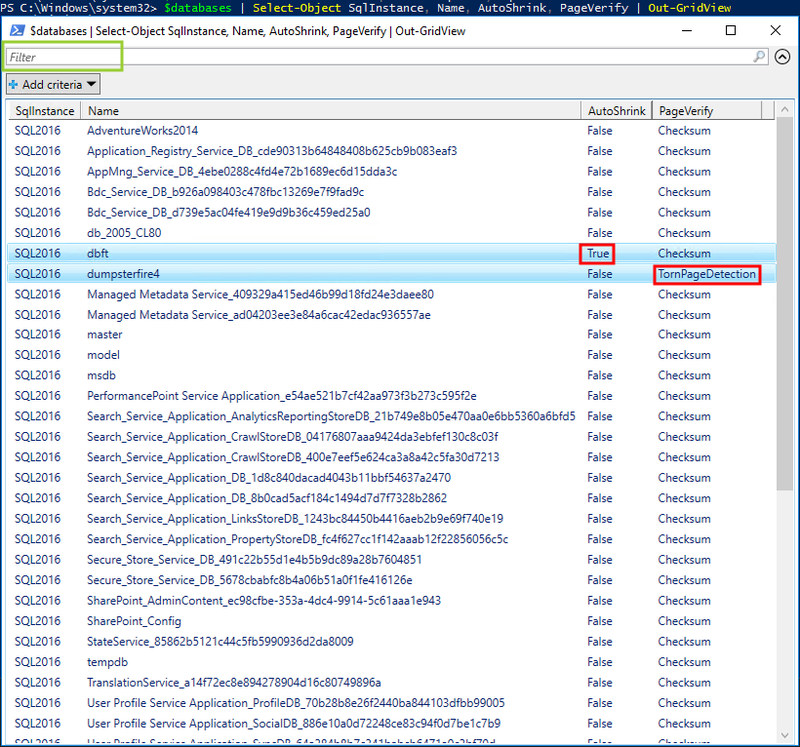 You can even use the -Append to append results to an existing file as Rob described on dbachecks – Configuration Deep Dive blog post. 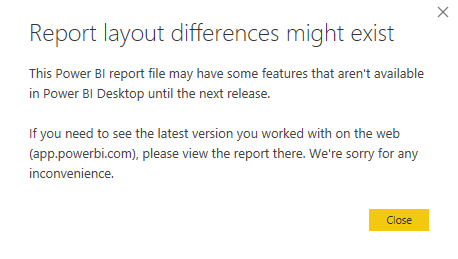 For a more pleasant and smooth experience, we recommend that you update your Power BI desktop to the latest version. Nowadays, Power BI’s team releases a new version every month. Each new version brings new features and improvements. Because we may be using the most recent version of Power BI (desktop) to take advantage of some of those, we also encourage you to use the most recent version. You can download it from the official Power BI website. This was the result of an attempt to open a file on the December 2017 version that was saved on a more recent (the February 2018) version. Which file should I open? pbix or pbit? pbix – is a document created by Power BI Desktop. It contains queries, data models, visualizations, settings, and reports added by the user. pbit – is similar to pbix but it is a template. You can configure variables that will be asked when you open the file. Those can act, for instance, as filters. 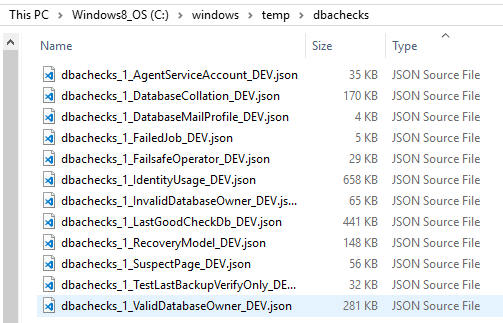 By default, dbachecks will output the results to the “c:\windows\temp\dbachecks” folder. This folder is also the default one configured in the pbix file. This path is the only variable that we use on the pbit file, which means if you don’t need to change your path because you relied on the default one, you can just open the pbix file and click refresh. On the other hand, the intent of the pbit file is to make it easy for people that are not so comfortable with Power BI desktop, this way they just need to type their output folder (where all the JSON files are) and they are ready to go. Where this is different from the other file? On the other file (“pbix” extension), you need to go to edit queries menu in order to change your path. This is a more “advanced way” to do it, so if you just want to start to see your tests results in a beautiful way, you can open the template file (“pbit” extension), fulfil the requested path, hit Load and wait for it to load all of your results. Note: When using pbit, if no objects appear, please make sure you have entered the correct path. Wrong paths will lead to empty dashboards. You have opened the pbix file but you are not seeing (your) data? The pbix file will keep the last data you saw on the dashboard. If you have rerun all or some tests, don’t forget to click the “Refresh” button! Only after refreshing the data source you will get all the data (re) loaded and thus get the most recent version of it. On this liftoff of dbachecks, our Power BI file includes two dashboards. If you never used Power BI before you may not know that you can maximize just one visual (almost any type) and come back to the report whenever you want. This is cool when you have a lot of information and you want to take a closer look. This dashboard gives to you a glance at how good/bad your environments are. This is done, at first, by the 2 circles with percentages and green/red waves. On the bottom, you can find a grid that shows all the failed (and only failed) tests with a descriptive message. To help you to read this dashboard, on the left side you have the quick filters by Environment and Instance. There are two other ways to filter the information – you can select a row on the matrix or on the grid to see information just related to that row. The main objective of this dashboard is helping you to understand which tests take the most time to run. Bear in mind that the times you will see are just the time that one test or the sum of tests took. The time switching between tests are not accounted. I use this dashboard to understand which tests should/can be running in parallel and that way make the full execution faster. Also, you can decide that some tests don’t need to run on the same frequency than others. On the next example, I can see that my Production environment is the one taking the most time to complete, then I filter by it and I can see that the “Testing duplicate indexes” and “Testing Column Identity Usage” are the ones that take the most time. If I want, I can exclude them from the bar chart just to take a closer look at the other test times. Finally, I can go to the filters and remove them resetting the bar char right where we started. To accomplish these dashboards, some rules must be followed. For example, the “Context” message needs to follow a specific nomenclature. You can read more about it on our wiki on Github. If these rules are not followed when writing the tests, you can see some weird results on the dashboards. On this example, you can see six instances, but the last two “Procedures” and “table” appear because the test wasn’t write in the right way. Also, we have a unit test to help you check for these “Context” rules! The data source on the Power BI was built to be dynamic. Because we can output just 1 test result per file (a record) or multiple results in the same file (a list), we built it so they can live together! You may be thinking how fast it is to load the data and apply all the transformations we have to the files. We had that in mind and we tried to reach a good performance on that task. I can load 270 files, totalling 397MB of data, in less than 30 seconds (the time will vary depending on the machine specifications). If you are curious, each file contains a single test for every instance in a specific environment. At that time I managed 7 environments with more than 100 instances. Now you can run your tests, analyse the output, make the changes needed, rerun the tests and start seeing your green percentage going up and the number of errors going down! We will bring some new dashboards and improve the existing ones whenever possible. If you have a case that you would like to see covered by a dashboard share with us. Do you already have it sort out? Share with us and we can replicate to our file. dbachecks is open-source available on GitHub for anyone to contribute. We would love you to contribute. Please open issues for new tests, enhancements, bugs. Please fork the repository and add code to improve the module. please give feedback to make this module even more useful. You can also come in the SQL Server Community Slack and join the dbachecks channel and get advice, make comments or just join in the conversation. Someone is not following the best practices – dbatools and Pester don’t lie! 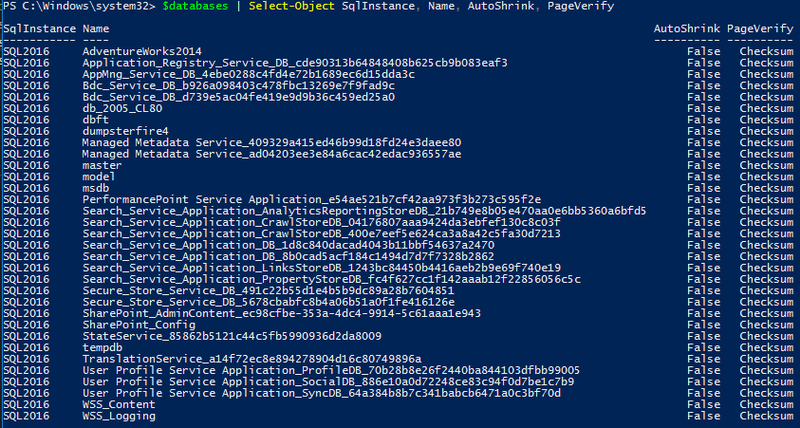 I have written some blog posts on how I use PowerShell to automate mundane tasks or some other more complex scenarios like: Find and fix SQL Server databases with empty owner property using dbatools PowerShell module or Have you backed up your SQL Logins today? or even using ReportingServicesTools module for deploy reports – SSRS Report Deployment Made Easy – 700 times Faster. But today I want to bring something little different. This year, back in May I saw two presentations from Rob about using Pester to do unit tests for our PowerShell code and also to validate options/infrastructure like checklists. This got my attention and made me want to play with it! 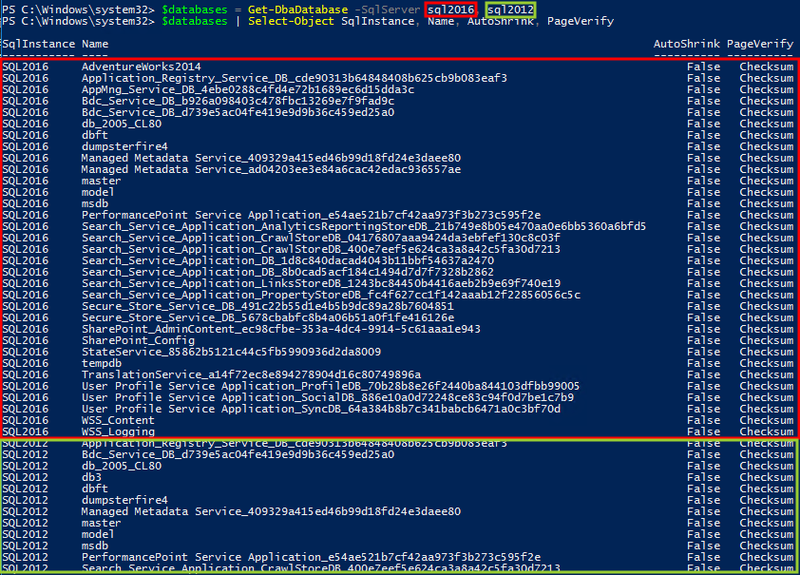 Therefore, I want to share an example with you using two of my favorite PowerShell modules dbatools and Pester. You go to a client or you have just started working on your new employer and you want to know if the entire SQL Server state complies with the best practices. has the MaxMemory setting configured to a value lower than the total existing memory on the host. For those who don’t know, dbatools is a PowerShell module, written by the community, that makes SQL Server administration much easier using PowerShell. Today, the module has more than 260 commands. Go get it (dbatools.io) and try it! If you have any doubt you can join the team on the #dbatools channel at the Slack – SQL Server Community. In this post I will show some of those commands and how they can help us. Disclaimer: Obviously this is not the only way to accomplish this request, but for me, is one excellent way! One existing command on the dbatools swiss army knife is Get-DbaDatabase. The Get-DbaDatabase command gets SQL database information for each database that is present in the target instance(s) of SQL Server. If the name of the database is provided, the command will return only the specific database information. 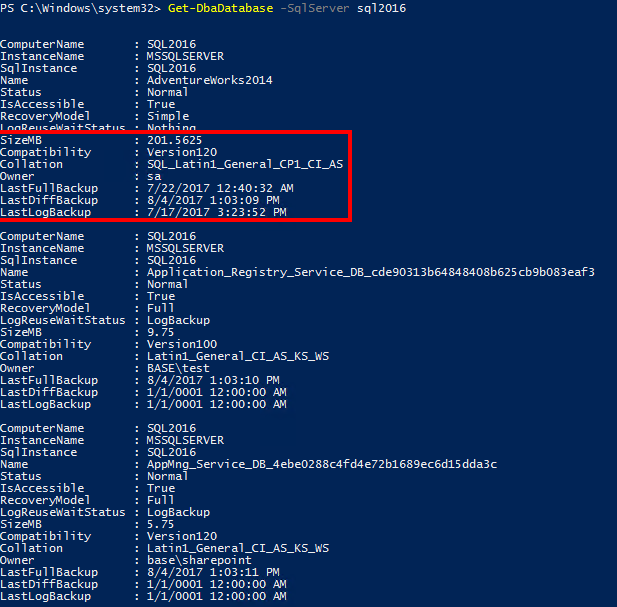 This returns the following information from all existing databases on this SQL2016 instance. That’s true, when we look to it, it brings not enough information. I can’t even get the “PageVerify” and “AutoShrink” properties that I want. But that is because we, by default, only output a bunch of properties and this doesn’t mean that the others are not there. To confirm this we can run the same code without the ” | Format-Table” that is useful to output the information in a table format but depending on the size of your window it can show more or less columns. Now, we can see more properties available look to the ones inside the red rectangle. You are right. But as I said before that does not means they aren’t there. Now we get a lot of stuff! The Get-Member cmdlet say to us which Properties and Methods of the object (in this case the $databases). So, we have found our “AutoShrink” property. With this in mind, lets query all the properties we want. We can pass multiple instance names and the command will go through all of them and output a single object with the data. As you can see I have passed two different instances sql2016 (in red) and sql2012 (in green) and the output brought both information. We can use another PowerShell native cmdlet called Out-GridView to show our results in a grid format. This grid also make it possible to use filters. For the next example, I have misconfigurated two databases so we can find them among the others. As you can see, inside red rectangles we have two not optimal configurations regarding the SQL Server best practices. You can also see the green rectangle on the top left corner where you can type text and the results will be filter as you type. So if you type “true” you will end just with one record. This command retrieves the SQL Server ‘Max Server Memory’ configuration setting as well as the total physical installed on the server. We can see that SQL2012 instance is running on a host with 6144MB of total memory but its MaxMemory setting is set to 3072MB and also, SQL2016 instance has 4608MB configured form the 18423MB existing on the host. As you see, it is pretty easy to run the commands for one or multiple instances to get information to work on. Also you have seen different ways to output that information. I encourage you to use the Find-DbaCommand to discover what other commands exists and what they can do for you. Using the dbatools module we could verify if the best practice is in place or not. But we had to run the command and then verify the values by filtering and looking for each row. You may be thinking that must exists some other more automated method to accomplish that, right? Pester is unit test framework for PowerShell. 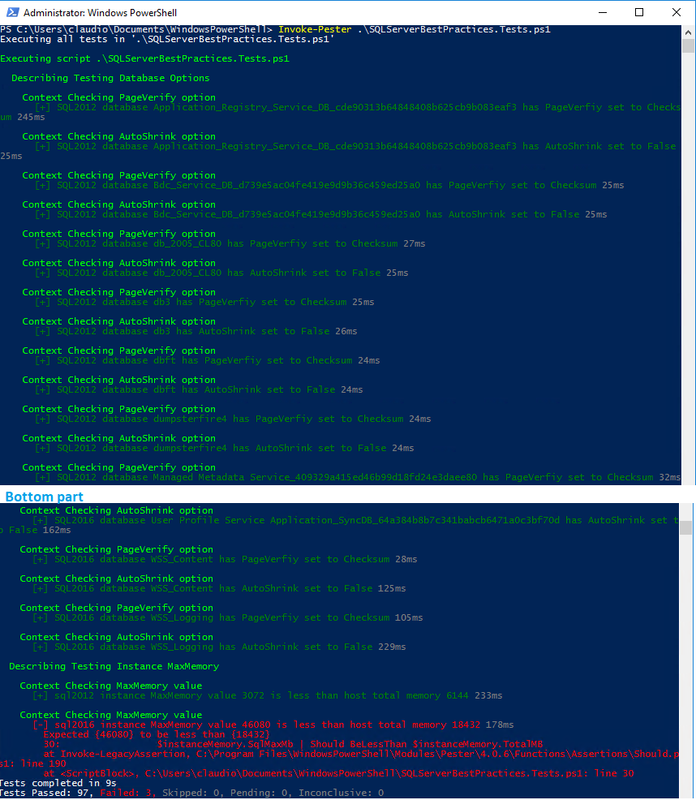 I like to say If you can PowerShell it, you can Pester it. Pester provides a framework for running Unit Tests to execute and validate PowerShell commands. 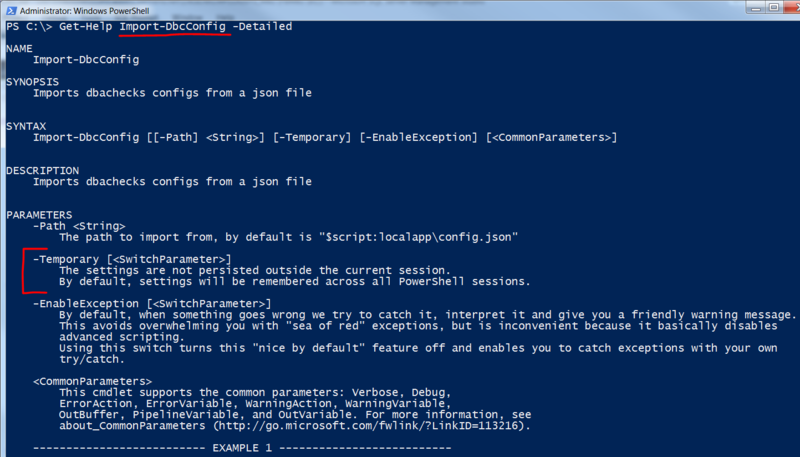 Pester follows a file naming convention for naming tests to be discovered by pester at test time and a simple set of functions that expose a Testing DSL for isolating, running, evaluating and reporting the results of PowerShell commands. Please see how to install Pester module here. With this framework, that I really encourage you to read more about it on the project Wiki, we can automate our tests and make it do the validations for us! We are checking if the login returned by the whoami is base\claudio. This return green which means it’s ok! And inside the Context block the validation that we want to do the It and Should. With this in mind, I can create tests for my needs using dbatools and Pester. To run this tests we should save a file with the “.Tests.ps1” ending name. Let’s save as “SQLServerBestPractices.Tests.ps1”. To run the tests we need to use the Invoke-Pester and the file that contains the tests. You are right, showing all the greens make us lose the possible red ones. But Pester has an option to show just the failed tests. But, be aware that -Show Fails can be a better solution, specially when you are working with multiple Tests.ps1 files. This way you can see where your error come from. As you can read from the last image from -Show Failed execution, the database “dbft” on “SQL2016” instance has the “AutoShrink” property set to “True” but we expect the value “False”. Now you can go to the database properties and change this value! Also, the “PageVerify” value that we expect to be “Checksum” is “TornPageDetection” for the database “dumpsterfire4” and “SQL2016” instance. Finally the MaxMemory configuration on the “SQL2016” instance is set to 46080MB (45GB) but we expect that should be less than 18432mb (18GB) that is the total memory of the host. We need to reconfigure this value too. Yes it is! Now when a new database is born on an existing instance, or you update your instances with a new one, you can simply run the tests and the new stuff will be included on this set of tests! If you set it to run daily or even once per week you can check your estate and get new stuff that haven’t been you to setup and maybe is not following the best practices. Get the fails and email them (I will blog about it). Check if your datafiles are set to growth by fixed value and not percent. Also if that fixed value is more than X mb. Want to Test your last backup? Or something completely different like Rob’s made for Pester for Presentations – Ensuring it goes ok? I hope you have seen some new stuff and get some ideas from this blog post! If you want to know if there will be some dbatools presentations near you, visit our presentation page. You can find some of our presentations on our youtube channel and code example on the community presentations on GitHub. About Pester and other examples and use cases, we have the Articles and other resources page maintained by the Pester team. I’m looking forward to read the other blog posts (follow the comments on Rob’s post, or the roundup later) on this month’s T-SQL Tuesdays and see what people is being doing with PowerShell.